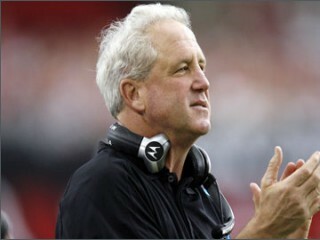 John Fox is the third and current head coach of the Carolina Panthers of the NFL. In his first season as Carolina's defensive coordinator in 2009, Ron Meeks moved the Panthers defense back among the NFL's elite, guiding them to an eighth-place finish in yards allowed and ninth in scoring. The scoring total was even more impressive considering that seven touchdowns were yielded via returns but consistent with the quality of work he has produced throughout his coaching career. As Indianpolis' defensive coordinator from 2002-08, Meeks oversaw a defense that ranked among the top seven in the league in points allowed five times. Under Meeks' direction, the Colts produced one of the best defensive performances in franchise history in 2007. They led the NFL in scoring defense with 262 points allowed and finished third in total defense - the team's highest rating since 1971 - by surrendering just 279.7 yards per game. Additionally, Indianapolis generated the second-most take-aways in the league with 37 and tied for second with 22 interceptions. Safety Bob Sanders was named the Associated Press Defensive Player of the Year. In 2006, Meeks battled through injuries on a unit that peaked during the playoffs, holding three-of-four opponents to less than 100 yards rushing en route to a Super Bowl XLI championship. During the 2005 campaign, the Colts stood second in the NFL in scoring defense, yielding only 247 points - the lowest 16-game total in club history. Indianapolis' stingy defense held six opponents to nine points or less. Three players: defensive end Dwight Freeney, linebacker Cato June and Sanders, earned Pro Bowl honors. The previous season, the Colts were first in the NFL with a plus-19 turnover margin after forcing 36 turnovers, which tied for third in the league. The defense also collected 45 sacks, which tied for third in the NFL, as Freeney set a team record with a league-leading 16 quarterback takedowns. In Meeks' first year in 2002, Indianapolis improved from 29th to eighth in the NFL in total defense and jumped from 31st to seventh in scoring defense. Meeks joined Indianapolis from St. Louis, where he served as the secondary coach in 2001 and helped revitalize the defense. The Rams climbed from 27th to 10th in the NFL against the pass and won the NFC Championship, one season after Meeks coached the Washington Redskins defensive backs to a league rating of second against the pass in 2000. From 1997-99 he tutored the defensive backs coach with Atlanta. The Falcons were one of three NFC teams to limit opponents to less than 200 yards passing per game in 1999, and two members of Meeks' secondary, cornerback Ray Buchanan and safety Eugene Robinson, made the Pro Bowl in 1998 when the Falcons won the NFC Championship. Meeks began his NFL coaching career with Dallas in 1991 as a defensive assistant before spending five seasons as the defensive backs coach with Cincinnati from 1992-96. The Bengals led the NFL with 34 interceptions in 1996. Twice during his tenure, they ranked in the top 10 in the league in pass defense, placing ninth in 1994 and second in 1993. He started his coaching career at his alma mater, Arkansas State, in 1984 prior to handling the defensive backs at Miami (FL) from 1986-87, New Mexico State in 1988 and Fresno State from 1989-90. Meeks attended Arkansas State from 1972-76 and then played five seasons in the Canadian Football League as a defensive back for the Hamilton TigerCats, Ottawa Rough Riders and Toronto Argonauts. Defensive back: Arkansas State 1972-76. Pro defensive back: Hamilton Tiger-Cats (CFL) 1977-79, Ottawa Rough Riders (CFL) 1979, Toronto Argonauts (CFL) 1980-81. College coach: Arkansas State 1984-85, Miami (FL) 1986-87, New Mexico State 1988, Fresno State 1989-1990. Pro coach: Dallas Cowboys 1991, Cincinnati Bengals 1992-96, Atlanta Falcons 1997-99, Washington Redskins 2000, St. Louis Rams 2001, Indianapolis Colts 2002-08, joined Panthers in 2009. View the full website biography of John Fox.